Researchers have identified the remains of the earliest known modern humans to have left Africa. New dating of fossils from Israel indicates that our species (Homo sapiens) lived outside Africa around 185,000 years ago, some 80,000 years earlier than the previous evidence. Details appear in the journal Science. The co-lead researcher, Prof Israel Hershkovitz, told BBC News that the discovery would fundamentally alter ideas of recent human evolution. "We have to rewrite the whole story of human evolution, not just for our own species but all the other species that lived outside of Africa at the time," the researcher, from Tel Aviv University, explained. Prof Chris Stringer of London's Natural History Museum, who was not involved in the study, said: "The find breaks the long-established 130,000-year-old limit on modern humans outside of Africa. "The new dating hints that there could be even older Homo sapiens finds to come from the region of western Asia." The new scientific dating evidence raises the possibility that modern humans interacted with other, now extinct, species of humans for tens of thousands of years. It also fits in with recent discoveries of remains and genetic studies that also indicate an earlier departure from Africa. 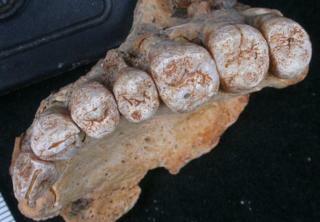 The researchers analysed a fragment of a jawbone with eight teeth, found in Misliya cave in 2002. The jawbone looked as if it was from a modern human rather than from one of the other species of human that existed at the time. It is only now that an international research team has conclusively shown that the archaeologists' initial gut feelings were spot on. The researchers confirmed that the jawbone belonged to a modern human by carrying out computed tomography (CT) scans of it, building up a 3D virtual model and comparing it with archaic human fossils from Africa, Europe and Asia - as well as modern human remains. Separate scans also enabled the researchers to probe the tissue beneath the tooth crowns, which was found to be uniquely associated with modern humans. Three separate dating methods, conducted in three separate laboratories unaware of the others' results concluded that the fossilised remains were between 177,000 and 194,000 years old. Before that, the oldest evidence of humans outside Africa came from the Skhul and Qafzeh archaeological sites in Israel, and were dated to between 90,000 and 125,000 years ago. The Misliya remains were found in a layer containing stone tools that belong to the Levallois type, which was used in the region between 250,000 and 140,000 years ago. If Levallois tools are associated with the spread of modern humans into the area, it suggests that our species may have journeyed beyond Africa even earlier than the dates for the Misliya material. Until recently, early evidence for excursions outside Africa by Homo sapiens was limited to the Levant. But in the last few years, discoveries of modern human fossils from Daoxian and Zhirendong in China dated to between 80,000 and 120,000 years ago suggest early waves of migration pushed further into Eurasia than previously supposed. In addition, genetic studies have turned up signs of early interbreeding between African humans and our evolutionary relatives the Neanderthals. Last year, researchers published evidence from German Neanderthal remains of mixing that occurred between 219,000 and 460,000 years ago. And in 2016, a team found signs that pioneer groups from Africa interbred with Neanderthals in the Altai region of Siberia about 100,000 years ago. "We had so many new pieces of evidence and we didn't know where they fitted," said Prof Hershkovitz. "Now with the new discovery, all the pieces fall into place - an exodus possibly as early as 250,000 years ago, which is the date of the tools found in the Misliya Cave." However, the early excursions into Eurasia by African Homo sapiens represented at Misliya are generally thought to have ended in extinction. Findings from genetics and archaeology suggest that present-day people living outside Africa trace their ancestry to an exodus just 60,000 years ago. Most DNA studies have failed to find evidence of these older migrations in our genes. Other discoveries have shed light on when humans in Africa evolved to become anatomically modern. Last year, a team announced that fossils thought to be early versions of Homo sapiens in Morocco had been dated to about 315,000 years ago. This is much earlier than the generally accepted 200,000-year date for the origin of our species, which is based on genetic studies and fossil finds such as the 195,000-year-old Omo remains from Ethiopia. And it's possible that future discoveries might push the date back even further.